Today on the blog I wanted to show you my favorite hosiery by SILKS®. Hosiery is a staple in every woman’s closet, and SILKS® BEAUTIFUL® hosiery with LYCRA® XCEPTIONELLE technology is one of the best fitting pair of hosiery I have ever found as a plus size woman. Whether its going to work, or heading to a holiday party, these sheers are perfect for giving me a natural look on my legs and are comfortable enough to wear all day. 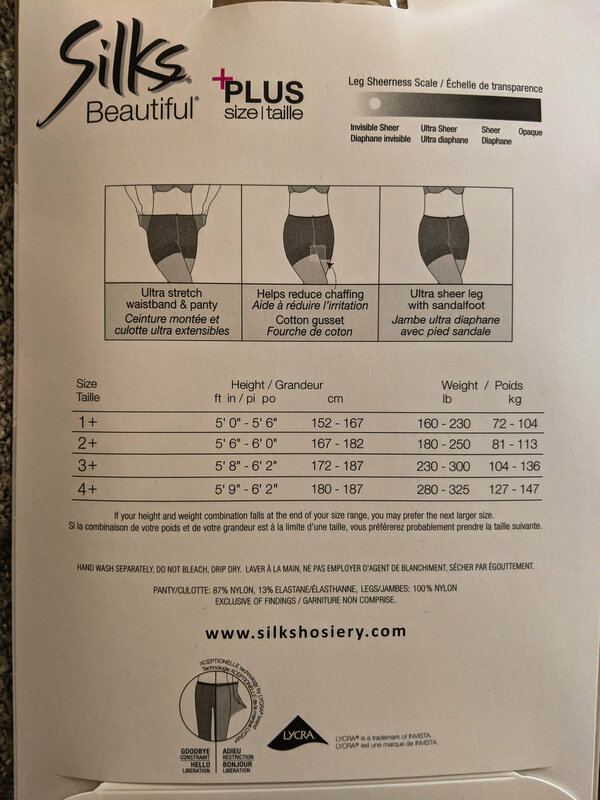 One of the fabulous features of the SILKS® BEAUTIFUL® pantyhose is how stretchy the waistband is. With other brands of hosiery, I’ve found that the waistband slides down and sits above my hips. The LYCRA® fiber (which is a branded spandex/elastane fiber) in the SILKS® BEAUTIFUL® hosiery makes these more durable and fit better overall because the fabric moves with my body instead of sitting just on top of it. Thigh chaffing can be a real nightmare for me and for most plus size women. I used to wear shorts under my skirts and dresses just so I could make it through the day. My favorite feature of the SILKS® BEAUTIFUL® pantyhose is the reinforced thigh area which reduces the amount of chaffing that will occur. I also wanted to include the size guide from the back of the packaging to help you guys determine what size would work for best for you. I wear the 2+, and if your height or weight is at the end of your size range, I recommend going up a size. This Post has been Sponsored by @LYCRAbrand and @SILKShosiery. Find out more about the SILKS® BEAUTIFUL® styles at your favourite Canadian retailer, The Hudson’s Bay, click the link here.